It is rare to describe an artist’s music as genuinely haunting, but Bianca Muñiz’s unique blend of jazz, pop, and rock fits the description in the best way possible. Muñiz, originally from New York, is an up-and-coming young musician working on her debut album, due for release in June. Her band—comprised of vocalist sisters Bianca and Jacqueline Muñiz, bassist Alex Talarico, saxophonist Baptiste Horcholle, and percussionist Michael Hojnacki—is currently on a one-week tour in Montreal, with performances at La Marche à Côté, Le Cagibi, and Barfly, where I caught her performance this Tuesday. I had briefly met Muñiz and bandmates earlier that day, when they performed at CKUT 90.3 FM’s Funding Drive live show at Dispatch, a coffee shop in the Plateau. Immediately, I was struck by the warmth they exuded as a group. Muñiz’s percussionist, Michael Hojnacki, with whom I had spoken via email earlier in the week, seemed to be all smiles, all the time. His enthusiasm for the band’s music and their future was contagious—I was told, by both Jacqueline and Bianca, that it had been his idea to come to Montreal for the band’s first international tour, after he visited the city this summer and fell in love with it. When he proposed this idea, Muñiz was in treatment for breast cancer, having undergone a double mastectomy earlier this year at only 22 years old. Absolutely nothing is wrong with my chest, I am perfect the way I am,” she writes on her blog. “My chest is a trophy of how amazing my body and I are and everything we’ve been through. 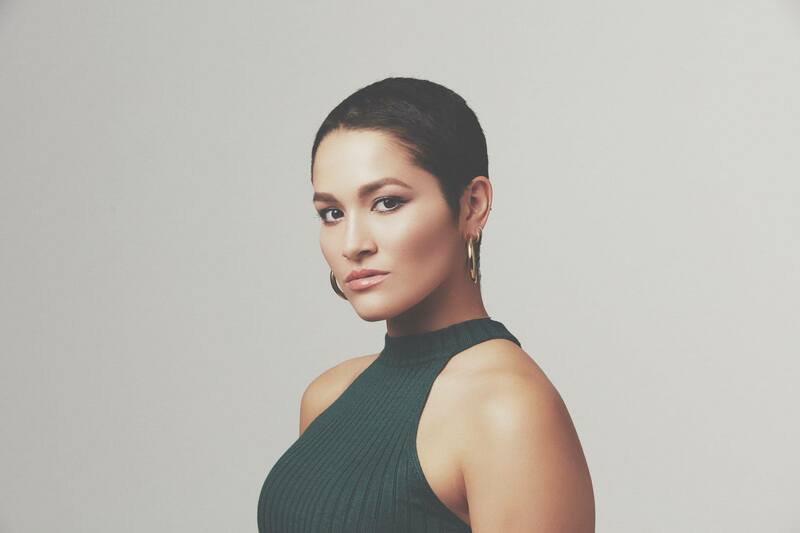 Through all of these trials, Muñiz describes music as part of her healing process—and while her story and experiences are what first drew me to her music, they are only the beginning of her artistry. The first thing that strikes you about Muñiz is her sheer talent; the second is how immediately likeable and kind she is. Standing next to her for a photograph, I jokingly said that I was really intimidated by her beauty (she is, undeniably, stunning)—her response was to immediately compliment me in return, with the joy and familiarity of an old friend. Bianca and Jacqueline sound like magic, performing together. On this tour, Bianca was on piano as well as vocals, given the absence of their pianist; and if you looked carefully, you would notice that percussionist Michael Hojnacki was playing with one hand. He had mentioned to me jokingly before the show that he had fractured his left arm in a hit-and-run in New York – this fact didn’t seem to faze him in the slightest, and if it compromised the band’s performance, the audience certainly didn’t notice. The band has an eerie, insistent sound—I hadn’t really understood their self-description of “avante-pop” until I heard them live. As I see it, the band’s sound can’t necessarily be described by genre as much as by feeling. For me, this feeling is a bit like running to catch a train that’s leaving the station—urgent, quick, full of longing and anticipation. There is a sense of drama to Muñiz’s music, consistently underlaid with intense percussion and bass guitar, taking breaks only to allow for lively saxophone solos. At one point, Hojnacki did a one-handed drum solo—at another, bassist Alex Talarico grabbed a drumstick and played his guitar in a manner vaguely resembling a xylophone. It was a sight to behold, and certainly nothing I’d seen before. There is a sense of drama to Muñiz’s music, consistently underlaid with intense percussion and bass guitar, taking breaks only to allow for lively saxophone solos. Listening to the content of Muñiz’s music, it’s also clear that she was a poet before she became a musician. My favourite song of the set, and the titular song in her 2016 EP, is titled ‘Scary Dreams.’ Muñiz introduced the song by describing her inspiration for it—a vivid dream she once had, that New York was under attack. From this dream was born a chaotic, creepy, intense piece of music. She later told me that she has scary dreams all the time, but this one was a particular turning point in her songwriting. She woke up with the bass line in her head, and the song itself is a description of her dream. She recalls the ethereal “purple lights, sparkling lights, shining over my head,” the bloody water filled with bodies, and the feeling of free-fall while New York burned behind her. Nightmares are a recurring part of her life, but this dream stood out to her, and grew into something beautiful. Muñiz’s experiences with cancer and the debilitating effects of chemotherapy haven’t diminished her ambitions in the slightest. If anything, they have lit a fire within her. Muñiz’s career is at its early stages, but the band-family has big plans for the future. Muñiz admits to the financial difficulties of touring with the band, but this doesn’t dampen her spirits. Currently, she mostly performs around New York, all the while working on new tracks and planning a tour for next year. Until now, Muñiz may have sung about the anticipation of waiting for life to begin, but it’s clear that her adventure is already underway. Bianca Muñiz is performing at Le Cagibi on Friday, October 27. To find out more, go to biancamuniz.com or check her out on Facebook, Spotify, or iTunes.